Increasing numbers of children claim they carry knives and bottles to defend themselves against bullies, according to a report based on children in care. The document was written by Roger Morgan, the children's rights director for England, who said bullying by mobile phones and websites was rising. It says more children carry weapons, but children's minister Kevin Brennan said knife incidents remain "rare". Two-thirds of the 319 children surveyed said bullying was getting worse. Mr Morgan, who is based at the education watchdog Ofsted, said: "Bullying was once considered the domain of the school playground. "But more and more children and young people we spoke to are now suffering at the hands of bullies in many places - at home, in the classroom, in the street, and now even online." The report, Children On Bullying, found young people were worried that experiences of abuse could stay with them for life - and even lead to suicide. It was based on discussions with children in care or at boarding school. It says: "Some of our discussion groups told us that when bullying gets serious, a growing way of young people showing that they can defend themselves is to carry a weapon, such as a knife or bottle." And about four out of 10 youngsters said they had been victims of electronic bullying, such as receiving a threatening text message or mobile phone call. Bullying can also include having an embarrassing photo taken and circulated via the internet or mobile phones, as well as "happy slapping", where attacks are filmed. The report found social networking websites have become a means for bullies to target their victims. 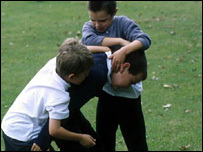 Research suggested that the most common types of bullying experienced by children were name-calling and being hit. About a quarter of those who had been bullied were coping by talking to an adult, the report said. However, the report also found four out of 10 children and young people never worried about bullying. Children's Minister Kevin Brennan said the report provided "a valuable insight into the views and perceptions of vulnerable children. "It is important that we listen to their opinions, learn from their experiences and carefully consider what they have told us," he said. The minister added: "We agree that bullies must be held to account for their actions and we have given teachers and heads hard-hitting powers to crack down on bullying, including permanent exclusion." However, he stressed: "We should remember that incidents with knives are incredibly rare."